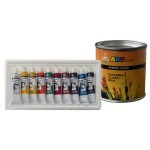 Use: They are intended for the creation of fine art works. They cover surfaces well and possess high power of colouring. They are made out as per the original recipe of Sava Sumanovic in a pallet of 10 basic shades.